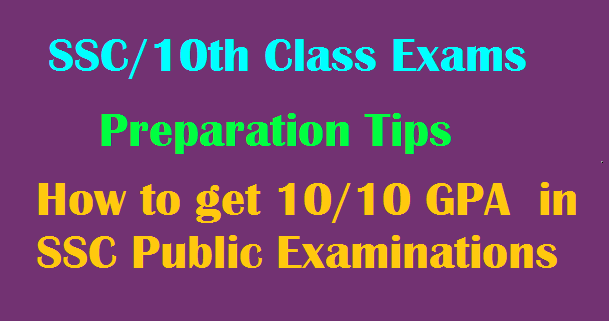 SSC/10th Class Preperation Tips How to get 10/10 GPA in SSC Public Examinations . How to get 10/10 GPA in SSC Public Examinations: Instructions To get 10/10 GPA in 10th Class | 10th Class – SSC Examination Tips to Score 10 GPA in Public Exams | How to get 10 points in 10th class | The Perfect Exam Strategy to Secure a 10 CGPA in 10th Boards | HOW TO GET 10/10 GPA POINTS IN SSC EXAMINATION | How to prepare for class 10th board exams | SSC SECRETS - A true guide for all SSC students | How to score 10 points in 10th SSC Board exams. Instructions To get 10/10 GPA in 10th Class. It is that time of the year when students of class 10 are busy preparing for their board exams, which are scheduled to start in March. So, for the ones who are going to appear for these board exams, this is the ‘make-or- break’ period! If they manage time well and study strategically, they can achieve what they want. Students, if you are still fooling yourself and thinking that there is enough time for your preparation, then it is the time to stop. Through this article, we will be provinding Subject-Wise Key Points and chalking out a strategy for you and will also tell you how many hours of studying is required to score a perfect 10 CGPA in 10th boards. First and foremost, if you pay proper attention in class (provided you attend all classes), take interest in reading the textbook and recollect the concepts taught in school every day, success is assured. Before class 10th, students are not introduced much to the idea of self-study. This is the right time to inculcate the habit, which will guarantee success not just in this exam but in every exam to come. The final month is important for everyone. The ones who have their preparation in the fourth gear can still improve it by putting it in overdrive; the ones who have some doubts can still improve by concentrating on their weak areas while simultaneously focusing on their areas of strength. During this time, the aim of students should be to perform to the best of his/her abilities and also concentrate on keeping themselves healthy.